Troops fire at Llanelli rioters who had stopped a train and attacked the engine driver. 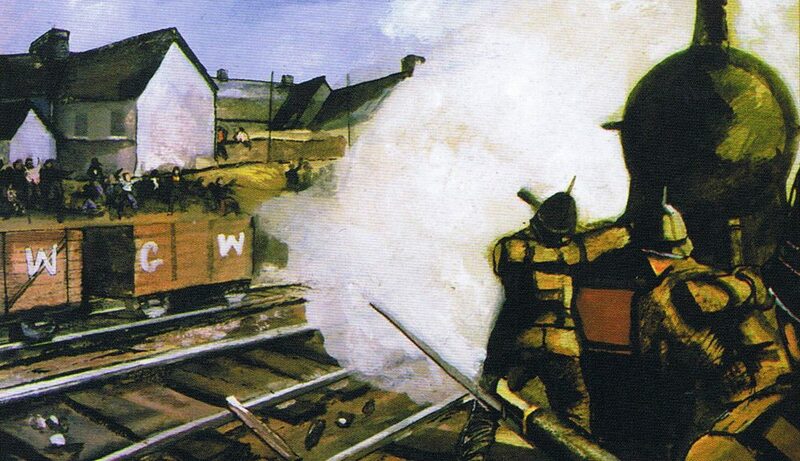 Painting by Stephen Meyler, from John Edwards’ book, “Remembrance of a Riot,” 1988. Mr. McDonnell’s swipe at Churchill was brief. Asked if he saw Churchill as a hero or vil­lain, he replied: “Villain—Tonypandy.” The Guardian com­plet­ed the dri­ve-by assas­si­na­tion, not only by head­lin­ing the remark, but with an inac­cu­rate rehash of the Tony­pandy riots in 1910. Blenheim Palace bedi­zened with Nazi Swastikas? File this in the over­flow­ing cat­a­logue of much ado about noth­ing. “I’m a jour­nal­ist with the Sun,” we were told by a mem­ber of their staff. “I’m work­ing on a sto­ry in our paper tomor­row about a dis­gust­ing act which tar­nish­es Sir Win­ston Churchill’s mem­o­ry.” He didn’t say what, but it was easy to guess.